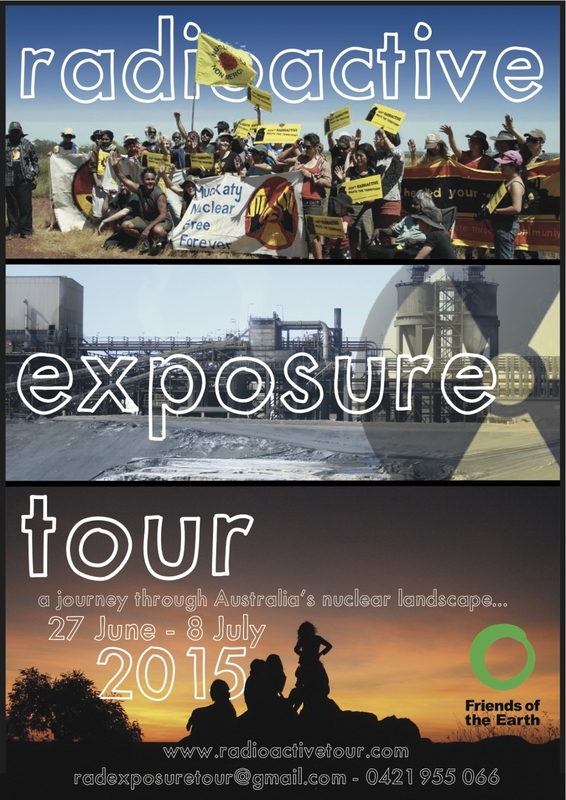 The 2015 Radioactive Exposure Tour was a multi-dimensional whirlwind dive into the nuclear landscapes of New South Wales and South Australia. We got up close and personal with Australia's only nuclear reactor, former uranium mine sites, both of Australia's two currently operating uranium mines, vast areas under uranium exploration and the five thousand kilometres of "nuclear freeway" in between. This year's radtour packed around 25 people into two mini-buses and a ute running on vegetable oil and started with the traditional pre-dawn packing session at Friends of the Earth on Smith St, Collingwood. Our first two nights were spent on a beautiful bush property of our friends from Uranium Free NSW. The camp at Jervis Bay was located near the site that was to be home to Australia's first nuclear power reactor under the government of John Gorton in the late 1960s. Gorton later acknowledged that there was a secret weapons agenda driving the Jervis Bay reactor project. Thankfully, a change of government dampened that sinister plan and we were able to swim the glorious waters of Jervis Bay without a nuclear reactor's shadow. A couple of hours north we were greeted by a large contingent of staff at the Australian Nuclear Science and Technology Organisation, Australia's only research reactor at Lucas Heights. We were fed promotional videos and various misinformation including "radiation is radiation", and therefore all the same. We asked lots of questions, and challenged the organisation on their role in ensuring responsible radioactive waste management. This includes preventing the manipulation of remote Aboriginal communities for a radioactive waste dump with such mythologies as the necessity of a remote waste dump for cancer patients to receive their treatments. After some campaign history from the "Atom Free Embassy" days outside ANSTO, we high-tailed it to the Blue Mountains in time for a public meeting in Katoomba. Eco-pella sang their ratbag tunes and we heard Donna Mulhearn's stories of acting as a human shield in Iraq and the devastating legacy of depleted uranium weapons use. After some classic group + banner photos at the Three Sisters the next morning we pushed on, heading west. Upon our arrival in Dubbo, we walked into a fascinating collision of locals and an Alkane Resources employee at a meeting organised by Uranium Free Dubbo, discussing the proposed rare earths mine 20 kms out of town. As rare earths are typically found in conjunction with radioactive materials, the mine poses radiological risks − nearby residents would get elevated radiation exposure levels when the mine operated, and the town would be left with radioactive tailings forever and a day. Locals are worried about drinking water contamination, and doubted whether they could trust the company and what benefit they would derive from the mine. Further west through open plains teeming with kangaroos and feral goats, we met with the thriving group "Nuclear Free Cobar" (one person) and eventually found the Broken Hill Racecourse Hall, a roof over our swags. The huge shed was somehow made cosy by the big feed that Kerry and Biscuit laid out for our weary arrival. While there are no current mine proposals, several companies have been prospecting for uranium around Western NSW. Leaving Broken Hill meant leaving big towns for a while, and heading for the territories of the nuclear cowboys. We built our first desert camp under a full moon, en route to the Gammon Ranges. We woke, packed and left before sunrise. Emus welcomed us to Adnyamathanha country, where protest broke out against the Beverley uranium mine in its first years of operation from 1997. One particular protest was subject to a ten-year legal battle to hold the police accountable for their use of force, capsicum spray and locking nine people in a shipping container for several hours. We travelled on, skirting north of the Flinders Ranges and west along the Oodnadatta Track. Now on Arabunna country, we unfortunately had to skip the famous Marree Camel Cup, an annual highlight, to make Lake Eyre for sunset. Everything slowed down for our dreamy "Oodnadatta Day". We visited several of the mound springs, lush desert oases of endemic flora and fauna that are dependent on the natural flow of the mineral-rich waters of the Great Artesian Basin to the surface. The springs have sadly been drying up since the Olympic Dam mine started sucking 37 million litres of water per day from underneath them. We shifted camp to the site of the Keepers of Lake Eyre camp, where Uncle Kev, Bilbo and others kept a constant watch on BHP Billiton for many years. After another incredible sunset and sunrise we had to tear ourselves away from that place for our uranium mine tour appointment at the gates of hell − Olympic Dam. In Woomera we toured the missile park with Avon Hudson, nuclear veteran and whistleblower for the Maralinga nuclear weapons testing program. During his time working at Woomera and Maralinga he amassed a trove of damning stories and information, which we are so lucky to hear every year on the radtour. Woomera locals Mick and Glenn shared our red dune campfire and told us some of their proud Kokatha family history of resisting uranium mining and the radioactive waste dump. Their families won the Irati Wanti campaign (the poison, leave it) more than a decade ago, and they are preparing for another campaign against radioactive waste in light of the SA Royal Commission into nuclear expansion, currently underway. From Woomera we found ourselves in Adelaide all too quickly, with some of the tour preparing to stay for the Students of Sustainability conference and others preparing for the drive back to Melbourne. After the opening fire ceremony we heard from some of the Aboriginal champions for a nuclear-free-world like Uncle Kevin Buzzacott, Mitch and Aunty Sue Coleman-Haseldine. Their words reinforced the relevance of the journey we'd just travelled, and the need to keep the fight alive for an end to the atomic age. The Radioactive Exposure Tour means many different things to different people. It is an education ... of the land, of the struggles faced by Aboriginal people, a window into what happens out there when the city isn't watching and a history lesson for the future. The radtour is a temporary community that must learn to get along, to work collectively and unravel patriarchal patterns in the way we function day-to-day. While travelling thousands of kilometres, we are fermenting information, ideas and conversation. Perhaps most importantly, the radtour is one way we grow the movement, maintain connections across vast distances, spark wild ideas and fortify ourselves for the next steps. Bring it on! Gem Romuld is a member of FoE Melbourne's Anti-nuclear and Clean Energy (ACE) Collective and was one of the organisers of the 2015 radtour. In 2014, the radtour made it all the way to Muckaty in the NT, which had been targeted for a nuclear waste dump until a spectacular mid-2014 victory by Muckaty Traditional Owners. In earlier years, we followed this route ... After travelling from Melbourne to Adelaide we will head through Port Augusta and visit the Aboriginal Tent Embassy. Then we'll travel north to the SA desert, we'll visit BHP Billiton's Olympic Dam uranium mine at Roxby Downs, the largest uranium deposit in the world. While the expansion of Olympic Dam is currently shelved, the mine is still an environmental and social disaster in itself. We'll watch sunset over Lake Eyre and see the Mound Springs − oases which are fed by the underlying Great Artesian Basin and host unique flora and fauna. Sadly, some of the Mound Springs have been adversely effected or destroyed altogether by the massive water take for the Olympic Dam mine. The water is taken from Arabunna land and we'll hopefully get to spend time with Arabunna elder Kevin Buzzacott, Co-President of the Australian Nuclear Free Alliance. We'll hear first-hand accounts of the British nuclear bomb tests from Maralinga veteran and whistle-blower Avon Hudson (also a Co-President of the Australian Nuclear Free Alliance). After stopping for a swim at Coward Springs, we'll head east and camp in the beautiful Gammon Ranges and visit the not-so-beautiful Beverley uranium mine. We'll hear about the struggle to prevent uranium mining in the magnificent Arkaroola Wilderness Sanctuary, camping nearby and in one of the beautiful gorges further south in the Flinders Ranges National Park.